The surging Inc. 500-ranked firm plans to add a third Factory facility and two new communities near the university. 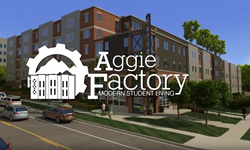 Nelson Brothers Professional Real Estate plans to expand the existing Factory student housing community at Utah State University in Logan, Utah. “We’re changing the whole landscape of USU student housing, and we’re going to build, manage and fund the projects ourselves." Nelson Brothers, recently ranked No. 4 in real estate and No. 129 on the 36th annual Inc. 500, has broken ground on a third Factory student housing facility and plans to build two additional communities near Utah State University. Nelson Brothers currently owns and manages 10 Utah student housing communities, including Factory 1 and Factory 2, both of which serve USU. Factory 3 will expand the existing Factory student housing complex by 53 single-occupant and married-student apartments, along with a six-story parking structure. The existing Factory complex consists of six-story buildings housing 80 apartments, a total 479 beds, seven stories of parking, and amenities that include a double-decker hot tub, bowling lanes, a swimming pool, modern study areas, a rock-climbing wall, a cinema room, a yoga room, and 2GB WiFi. Nelson Brothers has also announced the purchase of property across from the USU campus for the planned Blue Haven community which will offer 374 beds and an open courtyard layout for a campus-extension feel. The multistate real estate firm based in Provo, Utah, and headquartered in Aliso Viejo, California, has also purchased property one block away from campus for the planned 420-bed Apple Tree Cove community. Both facilities are currently in design with plans for resort-style amenities exclusive to Nelson Brothers student housing communities, with groundbreakings anticipated in 2018. Nelson Brothers’ recent announcements and Inc. 500 ranking reflect the company’s ongoing nationwide expansion trend, in which it’s realized a three-year sales growth of 3,111 percent for a total of $25.5 million in revenue. Thus far in 2017, the company has completed deals on nine properties with a combined value of $319 million. In 2016, Nelson Brothers closed on six properties, with $145 million in acquisitions. Overall, Nelson Brothers has grown the value of its portfolio more than 275 percent in the past two years alone. It holds nearly 40 properties across 14 states. Since its inception in 2007, Nelson Brothers has acquired and managed over $750 million in assets through the acquisition of 35 student housing properties and three assisted living properties across 14 states. For more information about Nelson Brothers, please visit http://www.nelson-brothers.com.